The 32nd Irish parliament (Dáil) has failed to appoint a new taoiseach (prime minister) after meeting for the first time on Thursday. Outgoing Taoiseach Enda Kenny was one of four politicians nominated for the role. The others were Fianna Fáil's Micheál Martin, Sinn Féin's Gerry Adams and People Before Profit's Richard Boyd Barrett. None received enough votes. Mr Kenny said he would inform the president he was resigning from office. However, he said both he and the government would continue to carry out their duties until a new government was formed. "Let me assure the Irish people that the government remains in place and I and my cabinet colleagues will continue to work hard in the best interests of the country and all of the people," Mr Kenny said. He said his immediate duties as caretaker taoiseach would be to travel to the US for St Patrick's Day - where he will meet President Obama - and a European Council meeting in Brussels next week. Mr Kenny got 57 votes for taoiseach - 50 from his own party and seven from the Labour Party. Mr Martin received 43, Mr Adams 24 and Mr Boyd Barrett nine. Earlier, Fianna Fáil's Seán Ó Fearghaíl was elected ceann comhairle - speaker - of the Dáil. His nomination for taoiseach was supported by former coalition partner, the Labour Party, as well as his own Fine Gael party. Labour leader Joan Burton said there was an onus on Fianna Fáil to "step up to the plate and seek to remedy their wrongs", calling for the party to form a government with Fine Gael. She said the two parties could provide numbers to give stability. The Labour leader said with a conservative government, "there is a real risk economic policy will veer to the right", but added that her party can be a "principled, reasonable opposition". The Independent Alliance's Shane Ross said they would not support any nominations for taoiseach. "We will participate eagerly and enthusiastically in a committee for political reform," he added. The first item on the agenda on Thursday was the election of the speaker. Mr Ó Fearghaíl was the only candidate left after Fine Gael's Andrew Doyle and Bernard Durkan, Sinn Féin's Caoimhghín Ó Caoláin and independent left-wing TD Maureen O'Sullivan were eliminated over four counts. Mr Ó Fearghaíl said he looked forward to working with everyone in the house to ensure a better future for the people of the country. Fine Gael is the largest party of the outgoing coalition government. Fianna Fáil were the main opposition party. Each of those nominated gave speeches to the Dáil on why they think they should become speaker and TDs then voted in a secret ballot. Fine Gael has 50 seats, Fianna Fáil 44, Sinn Féin 23 and the Labour Party got seven. Smaller parties and independents make up the other 34 seats. With the house heavily split among parties, there was no expectation of there being a taoiseach or a government formed by the end of Thursday. It is even likely Mr Kenny will still be caretaker taoiseach at the time of the centenary of the 1916 Easter Rising on 27 March. On the two previous occasions no taoiseach was elected, in 1989 and 1992, the first meeting of the Dáil was adjourned, more than once, to allow negotiations on the formation of a government. This is also expected to happen this time. Regardless of who will be taoiseach, the 32nd Dáil is expected to give more TDs control over the running of the house. One of the criticisms of the Irish legislature is that it has been dominated by the government. There is a growing recognition that has to change. In the meantime, behind the scenes, contact will be made to set up face-to-face negotiations between Fine Gael and Fianna Fáil. The only combination of two parties that would have an overall majority involves both. The two great centrist-parties of Irish politics have their origins in the original Sinn Féin. During the Irish Civil War in the early 1920s, the two fought over the treaty that gave what is now the Republic of Ireland self-government and independence. Divided by "irreconcilable similarities", they have never been in government together before and both ruled out such a development during the recent campaign. Fine Gael appears to be moving towards offering Fianna Fáil a grand coalition. The move could see both parties sharing the job of taoiseach for the sake of stability. However, opposition to such a development remains strong in Fianna Fáil. Éamon Ó Cuív, the grandson of the party's founder Éamon de Valera, has made his views known on this. However, for another election to be avoided in the near future some form of understanding will have to be reached. While we are still in the opening chapter in the story of the 32nd Dáil, it is certain there are many twists and turns left. 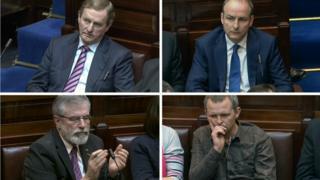 Irish election: Could civil war rivals Fine Gael and Fianna Fáil form first coalition?